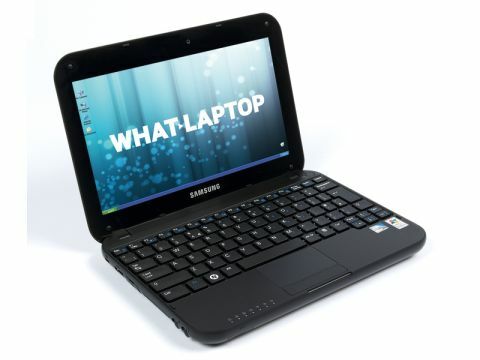 Samsung has followed up its successful NC10 netbook with the N310 (£399 inc. VAT). Introducing an all new look, the machine provides good portability and a new pebble design keyboard. The 10.1-inch screen provides sharp images with bright, defined colours, and the panel is encased beneath a glossy flat sheet of plastic which sits flush with the bezel. The chassis is constructed from a rugged plastic, providing good protection for life on the road. The rounded corners look great, and also make the machine easy to slip into a carry case or handbag. Undoubtedly, the netbook's best feature is its pebble keyboard. The keys are cut out of the board making them hard to miss-hit, and they're also nicely spread out, providing one of the best typing experiences we've seen on a netbook. Internally, the N310 is powered by an Intel Atom processor. This is the processor of choice for most netbooks, and uses very little power, remaining cool at all times. The 1024MB of memory is also standard netbook fare, but is enough to run several applications at once with little lag. An integrated Intel GMA 950 GPU provides basic graphical capabilities. The 160GB hard drive is more than generous and can hold all your work files, as well as music, videos and photos to keep you entertained while you travel. Mobility is average. While the machine only weighs 1.2kg, meaning you can take it anywhere with you, the 148-miniute battery life falls behind other netbooks and means you'll have to take the charger with you if you're away from the office for long. Extras include three USB ports, an SD card slot, 802.11g Wi-Fi, a VGA out and an integrated camera for video-conferencing. While the N310 is a great netbook boasting good usability and performance, it comes at a cost. There may not be many better looking netbooks available, but there are plenty which offer similar performance at a cheaper price.